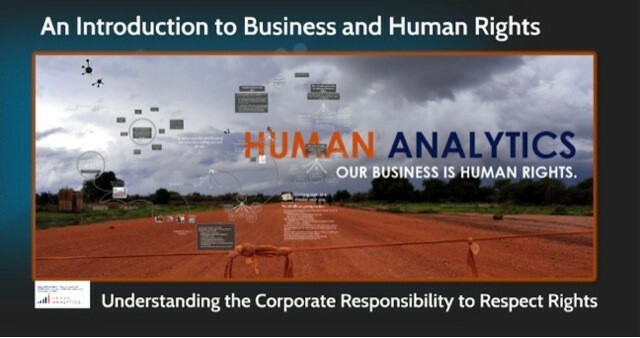 Human Analytics is pleased to offer a free Business and Human Rights 101 Prezi slide show. The presentation is an introductory exploration of the origins and emergence of international consensus on the corporate responsibility to respect human rights. It examines the provisions of the UN Guiding Principles on Business and Human Rights (UN GPs), which were unanimously endorsed by the UN Human Rights Council in 2011, and details key concepts relevant for companies, including human rights due diligence, corporate complicity, leverage, and responsibility for business relationships. A growing number of companies are recognizing the business case for implementing the UN GPs. This resource offers a helpful introduction for those unfamiliar with the human rights responsibilities of business. To view the Prezi, click here.